Life was good in Gülyazi, I heard. Poor and not easy, but good. Happy, even. I wish I had been here a year and a day ago, so I could have experienced it myself. But a year and a day ago, I, like many other people, had never heard of a place called Gülyazi, a town in the Uludere district. Everything changed last year. With a bombing in which 34 villagers were killed, twenty of them children. They were smuggling, like the people of this region have done for decades to earn a living, and were ‘mistaken for PKK fighters’. Thirty four bodies ripped to pieces and burned beyond recognition – they were smuggling petrol. Who gave the order to bomb? It is as I predicted after the bombing: the state has done nothing but cover up the Uludere massacre. A commission was set up in parliament – a subsidiary commission of the parliamentary human rights commission – and several times they announced a date for release of the report with their findings, but the report never came and has now been postponed to January. But in no way can I pat myself on the back for predicting this. Anybody could have known this in advance, because till now the state has never answered any questions about murders they have committed, now or in the past. That’s why my next prediction is easy too: even if the report is ever published, it will give the villagers none of the answers they need. Where did the intelligence come from, who interpreted it and how, and based on which information was the decision taken to bomb the smugglers? How come the one(s) ordering the bombing didn’t know that the smugglers were on their way again, like it was always notified to the gendarmes? Or did they know? Who gave the order to bomb? Why did it take so long before help came to the place where the bombing happened, to try to save the lives of the few people who didn’t instantly die? I visited Gülyazi right after the bombing – read the publications of those days here – and I came back for two weeks in spring, and I returned again for the Feast of Sacrifice, in October. And now I am here again, to commemorate the loss of 34 lives and to report about what’s happening. I have seen no healing in this year. The people don’t get the chance to heal. The state is scratching the wound open over and over again. Not only because they don’t give any answers to all the questions, but also because cruel things have been said by several members of the government (read an example here), no sincere apology has come. The damages the state says it has paid were not accepted by the people. Culturally, it is not necessarily a bad idea to apologize for and compensate a loss with money, but it only works when it is accompanied by a sincere show of regret, and with opening up. What has struck me this year and what really makes me so sad is how the bombing has affected everybody in the village in so many ways. For example, in October I talked to a 17 year old boy who I had talked to earlier that year as well. I just wanted to chat a bit, so I asked how school was going. He had to quit school, he said. He couldn’t concentrate anymore after what happened, he failed all his classes and he had to pay a lot of money before the principle of the school would allow him to do the same school year again. His family didn’t have that kind of money. This week, something similar happened with another boy I talked to. He also quit school, like many of his friends, he said. None of these young students can concentrate on their school work anymore, and at the state school they attend the bombing and the loss of their close friends is never discussed. All these kids (still) go smuggling every now and then to contribute to the family income. That’s what hits me when I see them walking in the village: it was kids just like this who died. It must be burning inside them too: it could have been me. How can you deal with that as a young man of 16, 17, 18 years old? ‘The boys are dead’. That’s what a young woman who just turned 18 told me earlier this year. Again, I was just trying to chat a bit, and after she told me she had just turned 18 I asked her if there was any wedding in the picture. ‘I will never marry’, she said. ‘All the boys are dead’. One of the boys who died in the massacre was her brother. He was only 13 years old. Since the massacre, no weddings have been celebrated. People get married, but only in front of the imam, not officially, and there is no party. I have seen a video of a traditional wedding here, taken before the massacre. Picture a huge field surrounded by mountains, and then picture a huge, huge circle of people doing the traditional Kurdish wedding dance. The men in traditional costume, the women too, in brightly coloured glittering dresses. All in the past now. I tried to figure out when weddings will be celebrated again. Nobody had an answer. ‘Never?’ I asked. They just don’t know, but for now, they cannot picture ever celebrating a wedding again. This is little Mahmut, mentioned in the blog post, holding a picture of his dad. The neighbours, also related, mourn next to the fresh grave. 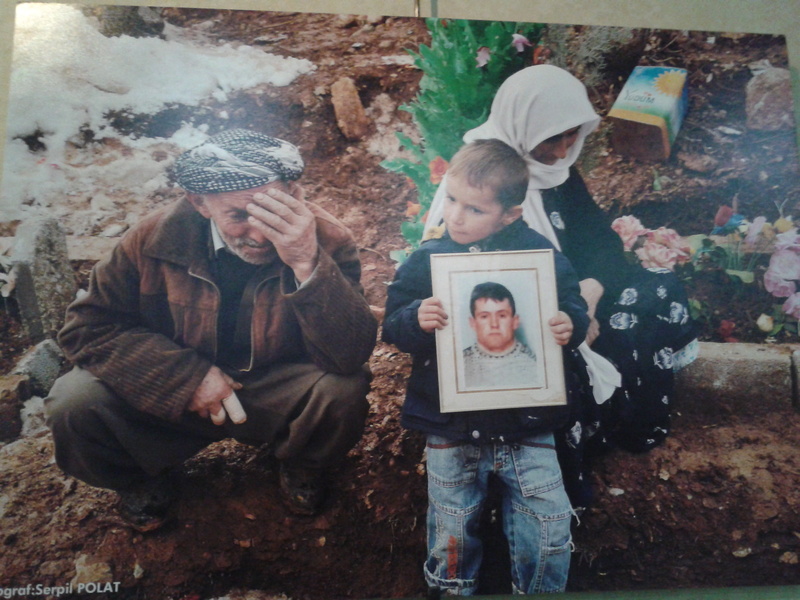 The picture was taken by Serpil Polat, and I took a picture of it at a photo exhibition about the massacre in Diyarbakir. Just like the women may forever wear black. The brightly coloured skirts and shirts that they got as presents from the wife of opposition leader Kilicdaroglu, who visited Gülyazi this year with some members of the women’s branch of the opposition party, are in cupboards now and won’t ever be worn. Some women were actually a bit pissed off after the women of the party left: do they actually think we wear skirts with orange and yellow flowers? I don’t know if Gülyazi will ever really heal. The state is forgetting about it slowly, as it has forgotten about all the other unsolved murders it has committed in the past in this region. But the people will never ever forget. It changed their lives forever. They do find some comfort though. I asked Pakize (29), who lost her husband Osman (32) in the bombing and was left to look after Özkan (12), Esra (11), Sinem (10), Hülya (8) and Mahmut (6), how she deals with the pain, and if she still has any hope of ever getting answers. She said: ‘I pray for it. That gives me some peace. Allah knows everything’. It was a real battle last week around the Middle East Technical University (METU, or ODTÜ in Turkish) in Ankara. PM Erdogan visited the university to witness the launch of Turkey’s first ever domestically produced satellite. Students wanted to protest, so Erdogan took along some 3,000 policemen who were very quick to attack the students, who started burning tires and throwing stones, after which the police used excessive force. Now, amazingly, the whole thing has turned into a battle between universities: those who support the students, and those who condemn them. For me it’s kind of simple. You cannot condemn anybody for demonstrating. It’s a democratic right, and that’s it. Especially students can’t be condemned for protesting. They are young, the ones studying at METU are supposed to be the smartest of the country, they are developing their thoughts, their direction in life, they have opinions, they are supposed to learn to think for themselves. As a student you do that by studying, discussing, reading, and, well, what student’s life is complete without a demonstration now and then? Especially in this country, where freedoms are being limited more and more. To not demonstrate against that as a student would be bad. The rector of METU thinks so too, and is behind his students, and several universities agree with him. Twelve universities though, among them even those considered to be among the best in the country, like Marmara University, Istanbul University and Mimar Sinan Art Academy, condemn the students’ behaviour. They write in a joint statement that the students were ‘trying to overshadow the historic success of Turkey in the field of space technology through violent acts’, adding that ‘the only way of protest for students should be with critical minds. Students should not be associated with rocks, sticks and Molotov cocktails’. Universities that want to limit the freedom to demonstrate. Unbelievable. But I’m not surprised. Turkish universities are not free themselves, but rather political actors. The state institution YÖK, the Board for Higher Education, controls academic life. They decide which universities have which faculties and which studies, how many students are allowed, who teaches where, everything. The rectors of universities are political figures too, appointed by the President. The ones from the universities that now condemn the students are the ones with rectors close to the the AKP government. They follow the Prime Minister, who said after the clashes that it’s universities’ first responsibility to teach students respect. New student protests have erupted after the METU clashes. One of the students’ demands is the abolition of YÖK, which was actually installed by the military rulers after the 1980 coup d’état. It’s been a long-term demand of students. And they are right, of course. Academic freedom without political interference is very important, and actually the basic requirement for any university to function properly. The students are brave to speak out and they should keep on doing so, while some rectors show themselves to be unworthy representatives of academic standards. ISTANBUL – The remains of Saint Nicolas must be brought back to Turkey, according to Navzat Cevik, archaeology professor at the Turkish Akdeniz University, as reported by Turkish press agency Anadolu. The professor claims to know that would also be the wish of the saint himself. Saint Nicolas is currently buried in the Italian province of Bari, after being, according to Cevik, illegally taken from Turkey in 1087. Saint Nicolas lived in Myra in SouthernTurkey, now called Demre. The saint has a church there, where many mainly Russian tourists visit. It is there that the saint should rest for ever. Archeologist Cevik added that Saint Nicolas is also an important figure for Muslims. ‘He tried to spread Christianity, and Christianity is a religion sent by God as well’, he told Anadolu. As far as is known, the Vatican, to which Cevik made his appeal, has not yet responded. News paper Taraf began publishing in November 2007. I remember it very well. I arrived in Turkey in December 2006, and when Taraf was first published we sometimes used it in Turkish language class. The writing in the paper was grammatically not too complicated, and there was another journalist in language class too, so we sometimes picked Taraf articles to practice our reading skills. Only later did I gradually begin to understand the place of Taraf in Turkish media. This sounds like the start of a requiem for a paper, and in a way it is. Even though Taraf (Turkish for ‘Side’) is still available at the news stand, it probably won’t ever again be what it used to be. this week, editor in chief and most important columnist Ahmet Altan resigned, together with Yasemin Congar, the second most important journalist working there. Soon, a few other writers decided to leave the paper as well. Taraf wanted to takes sides in Turkey’s political landscape, against the old Kemalist elites who controlled the country via state institutions, and who basically blocked democratic progress. Taraf aimed at relentlessly attacking the power of the army, which still held sway over Turkish politics, as was again shown that very year (read earlier article of mine about that here). They were very successful at that, mainly by publishing and writing about classified army documents that were leaked to the paper. Without Taraf, the whole Ergenekon case (here’s a search for articles about that on this site) might never have existed, because they were the ones revealing the (still alleged) coup plans. Not any paper would have dared what Taraf did. The time seemed right for it: the conservative AKP had been in power since 2002, and the party also strived to diminish the armed forces’ limitless power. It soon lead to speculations that Taraf was only there to support the government, and even that they were funded ‘from abroad’, which meant by the Gülen movement. These last allegations were always denied, and in any case I don’t believe Gülen was behind it. I mean, the Gülen movement has serious money. If they funded Taraf they were definitely too stingy: Taraf writers often worked for very low wages, the paper made no money, hardly had any ads (which would have been a way for Gülen-related companies to fund the paper) and its founder reportedly lost money in pursuing his mission to establish Turkey’s bravest paper. Why Altan and Congar resigned isn’t totally clear. There is speculation about AKP pressure. Ever since the army has been more or less confined to the baracks, with the Ergenekon trials almost coming to an end, Taraf has increasingly aimed its arrows at the AKP. The AKP has developed into being the new threat to democracy, as the army used to be. Examples of it are Erdogan’s Sultanist tendencies, the serious problems with press freedom and with the lack of independence of the judiciary, which is more and more falling into the AKP’s hands. The AKP would somehow have pressured Taraf, and now the main actors at the paper have had enough of it. Altan, however, didn’t write anything about that in his last column for the paper. Considering everything he has bravely written in the last couple of years, I guess revealing intense AKP pressure against the paper would have been saying goodbye in style. That he didn’t, doesn’t really prove anything, so I guess for some time we’ll be in the dark about what is really behind this. Does he really want to just get back to book writing, as he wrote in his last column? And if so, why did Yasemin Congar also resign, and famous political scientist and columnist Murat Belge? Anyway, I think the ‘end’ of Taraf is a loss for the Turkish media landscape. I have never been ‘pro’ or ‘against’ Taraf. I found the paper brave, but I look at it as the outsider that I am, and try to define it’s place in Turkey’s media landscape. Taraf sold some 50,000 copies a week, about as much as the paper at exactly the other end of the spectrum, leftist nationalist, strongly Kemalist and pro-army Cumhuriyet, basically representing the ideology Taraf targeted. These two are comparible in another aspect too: they are both not in the hands of big companies that use papers for their commercial interests, but independently financed papers, based on ideology. To make a comparison with mainstream papers that are owned by big conglomerates and that don’t have any principles: tabloid paper Posta sells 450,000 a week, left-leaning Millyet some 170,000, Hurriyet 425,000. I find it interesting to compare Cumhuriyet and Taraf, because they together reveal something about developments in Turkey. Cumhuriyet has for a long time been important and influencial, but lost it’s significance and lots of readers because of being very dogmatic and because of a total lack of anticipating changes in society. The very changes that made it possible for Taraf to start, and to be small but nevertheless very influential. Taraf got the sign of the times, so to speak, Cumhuriyet lost it. So if Turkey apparently still has a place for Cumhuriyet, then it definitely must have a place for Taraf as well. Even more so for the latter, I would say, since they have been the voice of a new group in Turkish society, where Cumhuriyet is the voice of the Turkey that used to be. That Taraf is in fact now dead, shows that the timing was not as perfect as it seemed to be five years ago. Turkish society wasn’t ready yet. Or it was, shortly, and its enlightenment and the space it provided for liberalism and freedom of opinion for very unwelcome opinions, has gone. Only if Taraf manages to not only be on sale but also continues to practice daring journalism and get on the nerves of the powers that be, I will stand corrected. ISTANBUL – The Dutch Patriots, which might be stationed in Turkey as soon as early in the new year to protect Turkey against artillery fire from over the Syrian border, will probably be stationed near the city of Adana. Adana is Turkey’s fifth biggest city, some hundred kilometres from the Syrian border. Foreign military presence is not unusual there: since the nineteen fifties it has had an important American air base. The city has 1.5 million citizens and is modern, located close to the Mediterranean Sea and is an important economic centre. Besides that, the region around Adana is known as one of the most fertile places on earth: on a large scale, fruits, vegetables and products like cotton are being grown. The city grew rapidly in the nineteen nineties. The war between the armed Kurdish group the PKK and the state was at it fiercest at the time, hundreds of Kurdish villages were burned down in the Kurdish southeast of the country and many Kurds fled to the city. In general, Kurds in Turkey don’t support the strong anti-Assad politics of the governing AK Party. They believe PM Erdogan is mainly arming himself against the Kurdish population of Syria, which lives right across part of the border and which managed to build a certain degree of independence over the last couple of months. The Free Syrian Army doesn’t no say in Kurdish territory. The Democratic Union Party, the Syrian equivalent of the PKK, pulls the strings. In Adana, Reuters news agency reported earlier this year, there is a secret centre where Turkey, Saudi Arabia and Qatar collect intelligence and refer it to the Free Syrian Army. Whether that centre is located at the American base close to the city is not clear. 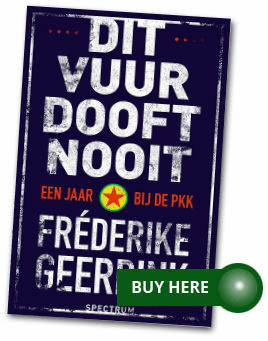 When the Dutch Patriots come to Adana, the city will again play a bigger role in Turkish and international Syrian policies. Even though the Kurds denounce Turkey’s politics concerning Syria, and many Turks, especially in border areas, don’t support it either, any increased tensions or protests are not expected in the city when the Patriots arrive. Dutch military personnel should prepare for a hot summer. In July and August Adana is one of the hottest cities in Turkey: the temperature easily rises to 43- 44 degrees Celcius. Many Adana citizens leave the city and go to summer houses in the cooler mountains, north of the city. A tour of the Kurdish production of a classic play opens a new frontier for the language. Eager spectators squeezed into whatever standing or sitting room they could find — aisles, stairs — because the theater’s 1,500 seats were all taken. Thunderous applause marked the end of the show as some viewers succumbed to tears. Theater producer Celil Toksoz still gets goosebumps when he thinks back to the first Kurdish-language performance of “Hamlet” in his native Diyarbakir. He attributed the emotional outpouring to the historic revival the Kurdish language has undergone in recent years as restrictions on its use have been rolled back. Yavuz Akkuzu (left) plays Hamlet; Rojda Senses (middle) plays Gertrude and Gulseven Medar plays Ophelia. Pic by me, click to enlarge. Toksoz and his Amsterdam-based RAST Theatre company, in co-operation with the Diyarbakir city theatre, are behind the ongoing international tour of a Kurdish production of Shakespeare’s classic play. After an autumn stint in the Netherlands, the production made its Turkey premier in Diyarbakir last month. Toksoz’s crew will perform in cities across Turkey before heading for northern Iraq and Germany around February. “It became a dream to produce a Kurdish ‘Hamlet’,” Toksoz told SES Türkiye. A more permissive attitude towards Kurdish has prevailed in recent years. The most restrictive bans were lifted in 1991, and as part of Turkey’s EU membership bid, private Kurdish courses opened in the early years of the the AKP’s tenure. Elective language classes in secondary schools introduced by the government earlier this year allow students to study Kurdish for two hours a week. A state Kurdish-language TV channel has aired since 2009. But because the language was stifled for much of Turkey’s history and Turkish is still the medium of instruction in public schools, some Kurds still struggle with the language. In a television interview earlier this year, Deputy Prime Minister Bulent Aric said the government was opposed to full education in Kurdish. Translator Kawa Nemir told SES Türkiye the “Hamlet” production team had some linguistic trouble. “Kurds are not educated in Kurdish, so there is a lack of understanding of their own language,” Nemir said, adding that some actors didn’t understand some words in the script. “That’s a sign that it is probably more difficult for the audience, so I adjusted the language by using more commonly used words,” Nemir added. Firat, 21, said he struggled at some points of the Diyarbakir performance, but that didn’t take away from his experience. In light of these difficulties, Toksoz and other Kurds have taken the initiative to revive and enrich their language. An increasing number of projects, like his, aim to develop the language in areas outside of daily life, such as theater and science. “The people, the history, the language, a people that still wonders who they are, if they can be or not be who they are. My home city, that’s what I have been working for,” the artist, who grew up in Turkey but spent most of his adult life in the Netherlands, told SES Türkiye. The play has been warmly received elsewhere in Turkey, including an Ankara performance attended by Minister of Culture Ertugrul Gunay, CHP Vice Chairman Sezgin Tanrikulu, and BDP co-chair Gultan Kisanak. The tour hasn’t all been smooth sailing. Perhaps unsurprisingly, it has become entangled with politics at certain points. Two people unveiled pro-Kurdish banners on the stage in Diyarbakir as the audience delivered a standing ovation; the applause grew louder. Diyarbakir Metropolitan Mayor Osman Baydemir thanked the actors for their performance before launching into a fiery speech on Kurdish rights. “I was asked several times why there is politics around the play. It wasn’t my intention, but it’s just what happens,” he told SES Türkiye. If you read this website regularly, you know there are many crazy court cases going on in Turkey. The prime example of the state of justice Turkey is in, however, is the case of sociologist, writer, human rights activist and feminist Pinar Selek. She has been in a Kafkaesk battle with Turkey’s court system for fourteen years now, over involvement in a bombing that never even happened. Pinar Selek, 41 years old, lives in France now, where she works as an academic. She cannot go back to Turkey, as the court case against her that started in 1998 is still not over. She is very active in Europe in human rights defence work and doing pretty well, I heard from one of her friends, but she’s also tired. Tired of fighting against a system that just doesn’t let go of her. Missing her friends and family, missing her country, not being able to continue the important work she had dedicated herself to in Turkey. What happened? It all started in 1998, with an explosion in the Spice Bazar in Istanbul, in which seven people died and more than 120 were wounded. Pinar Selek was arrested in July of that year, accused of involvement in what the prosecutor said was a bombing. She spent two and a half years in jail, and was only released after experts concluded the explosion was not caused by a bomb but by the accidental ignition of a gas cylinder. No, case not closed. The case against Selek continued, and in December 2005 the prosecutor opened a new trial against her for the same non-existent bombing. Acquittal followed six months later. No, case not closed. In March 2009, the Court of Appeals requested a review of the case and reversed the acquittal. Followed by a new acquittal, in May of the same year. No, case not closed. The Court of Appeals objected again in February 2010. The case had to be reviewed by a lower court. The lower court refused the review, ruled that the acquittal was legitimately and fairly given and upheld Selek’s acquittal. It was February 2011 by then. No, case not closed. In a hearing last month the lower court decided to drop its refusal to review the case and proceed with reopening the trial against Selek. The refusal to review was, the court claims, contrary to procedure. The first hearing of the re-opened trial is today in Istanbul. Pinar Selek and five other already acquitted suspects in the case of the non-existent bombing won’t be there. Her supporters will be. I hope Pinar gets some strength out of all the support she gets. Why? Why does the state keep chasing after a woman who they say was involved in a bombing that never even happened? That is, so it’s assumed, because of her academic research. It focuses on groups that are excluded from society. In the year before she was arrested, she decided to focus on Kurds, after she had been doing research on, for example, transsexuals and street children. That time frame, the nineties, was ultra-violent in the southeast of Turkey, but Pinar Selek decided to take up the dangerous job of talking to different sides in the conflict to investigate what exactly was going on. And that’s what got her into trouble. She talked to the PKK as well. After her arrest in 1998, her research was confiscated, she was tortured in prison to reveal her sources, and fake police reports were made up to incriminate her. The ‘bomb’ was just a way to get her. That there was no bomb is just a minor detail to the justice system. It was not about the bomb to begin with, it was about silencing a young, promising, brave academic and human rights activist. It can’t be predicted what the outcome of the court case today will be. Maybe Selek will now be acquitted ‘according to procedure’. If so, of course she still cannot feel safe – she was acquitted before. Her friend in Istanbul told me that some time ago, they were walking on the street in Paris and Pinar was often looking over her shoulder, afraid of being followed. She is constantly on her guard. It must indeed be deeply traumatizing to be caught up in such a mind-blowing case for years and years, never knowing when the nightmare will end and if you will ever have your life back. The other scenario is that the case will continue and that she will eventually be sentenced to life imprisonment with no chance of parole.